Is your life full of anger, violence, hatred, and general bleakness, covered by a glossy façade of upper middle-class values? Is your marriage hanging on by a thread because you don’t dare address your concerns in an open dialogue with your partner? Do you believe the only solution to your problems is screaming or heavy drinking? Would you like to see this horrible outlook on the world represented theatrically? If you answered yes to any of these questions, have I got a play for you! 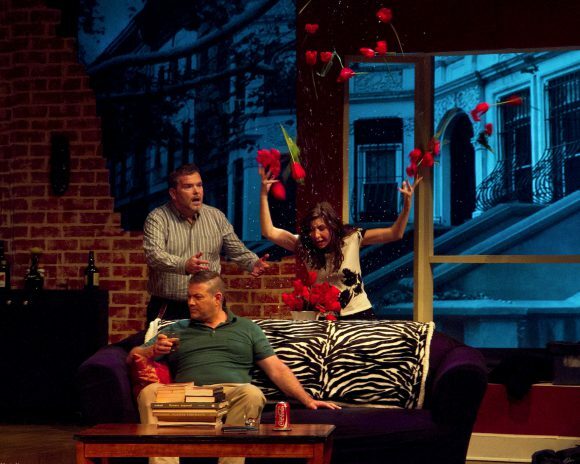 God of Carnage is 90 solid minutes of people behaving badly. It begins with investment banker Annette and her lawyer husband Alan (both dressed in stylish professional attire) meeting the more laidback Veronica and Michael in their home. Annette and Alan’s son recently whacked their hosts’ son in the face with a stick, breaking two of his incisors. The parents have gotten together to discuss this issue but civil discourse falls quickly to the wayside as the evening devolves into pointless arguments about basically everything under the sun. And then Annette vomits. By the halfway point, I had completely lost interest in anything that was going on onstage. There was no central conflict, no character development, no witty wordplays, and no great insight on the sociopolitical issues of our day: there was just an awful lot of fighting. First Annette and Alan are pitted against Veronica and Michael as they defend their son and shift blame onto the victim who ‘started it’. Then Annette and Veronica gang up on Alan and Michael as being boorish men encouraging their son’s awful behavior. Soon it’s everyone for themselves as the conflict escalates to ridiculous proportions including Annette throwing her husband’s ever-ringing cellphone into a basket of vomit. Life’s ugly and hard and awful enough as it is without sitting through an hour and a half of indiscriminate yelling. To say that I hated this play would be an understatement but I am clearly in the minority since the opening night crowd was awash with laughter from start to finish. And I will happily give credit to the amazing actors (Cindy Beaton, Jane Chambers, Patrick McIntyre, and Allan Ross) who created believable relationships and surprisingly three-dimensional characters amidst what was basically a prolonged shouting match. Despite the absurd amount of hostility they were forced to display, they all managed to make their characters realistic and interesting. I would have loved to see this cast tackle a less-painful-to-watch play. I read once that the 1990s TV show ‘Married with Children’ was popular because viewers enjoyed knowing someone out there had a life worse than theirs. If that’s the case, maybe God of Carnage functions in the same way. It’s just that I personally don’t find entertainment in the misery of others but I understand how it can be cathartic. But that’s just my opinion, I want to know what you thought. Did I totally miss the point? Who were you siding with as the show went on? Tell me what you’re thinking in the comments below. God of Carnage is presented by The Ottawa Little Theatre. It runs now through June 25th at the OLT on King Edward Avenue. Visit their show page for performance times and to purchase tickets.